Pictures from the Burberry Prorsum 2014 fall winter fashion show during London Fashion Week. If there is one show I would love to go to, it would have to be a Burberry Prorsum show. 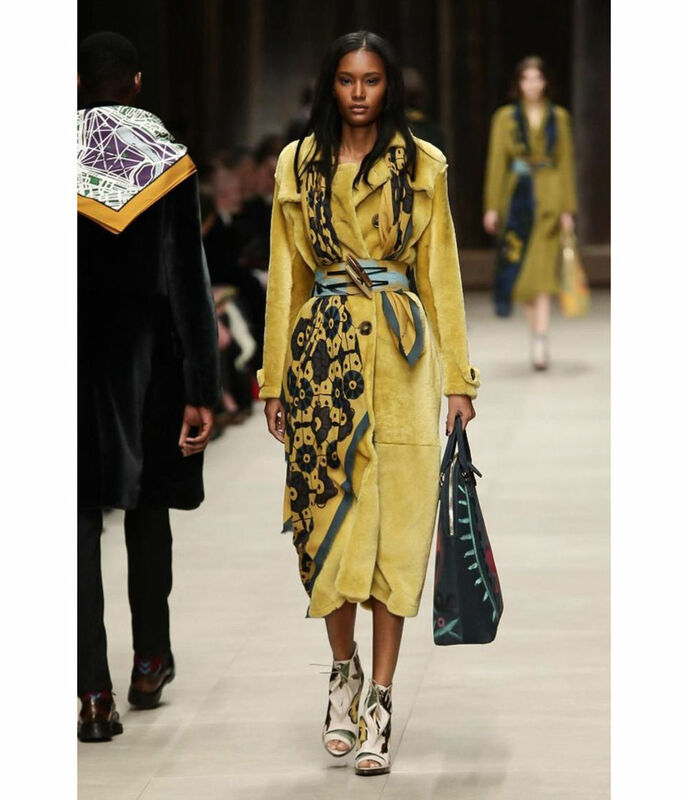 There is just something so fresh and modern about the Burberry women that walks down the catwalk every season. Every single piece and outfit , I - and probably most women - would love to wear. Every season you are left lusting over the pieces and the collection to come whilst wondering what could possibly come next. If you haven't yet, you can view teh entire Burberry Prorsum 2014 fall winter show below. Enjoy - I sure did. My Little Box is not just another ordinary subscription based box delivery, it is a whole world in itself. It all started with My Little Paris - a world full of Paris' secret addresses and unexpected ideas. Then came the box, but not just any ordinary box. A box with a different theme every month filled with beauty products, one-off unique products and now the My Little World magazine full of articles from bloggers around the world. I was very fortunate to be one of the inspirations for the magazine, and I am in great company. On a different note, it is great to see online articles being published in written 'media'. And that is not all, they have also just recently introduced The Gambettes Box- French for legs - inside which you get two different pairs of tights every month. What more can you ask for. 1. More genuine collaborations. There are so many identical and lifeless collaborations out there it has made the blogosphere somewhat boring and over-saturated and frankly loose all credibility. The whole purpose of a fashion blog is to share one’s ideas, trends and style. Be independent and creative, have a unique voice and take on things. However, fashion blogs are increasingly becoming carbon copies of one another - sharing the exact same press releases, videos and doing the same collaborations. 2. More professionalism. I believe PRs and brands alike need to accept the fact that good bloggers are increasingly able to make a living out of blogging. And thus need to stop using and abusing the ‘free advertising’ aspect of bloggers. They are too quick to propose ‘wonderful’ and/or ‘exciting’ collaborations. Yet just as quick to back down when it comes to discussing fees and other types of remuneration. 3. New faces. I would love to see – and I don’t believe I am the only one – new and up-and-coming bloggers in big collaborations. Not just ‘the usual suspects’, even though I have enormous respect for what they have achieved. But let's face it there are more than 20 bloggers out there. While I fully understand the marketing and branding opportunities of using the bloggers with the biggest ‘ROI’- what ever that means, visibility and following. And I can imagine that working with new talent can be both unsure and scary, I do think it would be nice to see fresh faces emerge. 4. A gown up ‘blogosphere’. By 'gown up', I mean a blogosphere where people – bloggers - respect each other, where contracts are signed and were partnerships are mutually beneficial. I don’t want to sound naïve but surely it is not too much to ask that there is a more ethical way of doing business all together. 5. New innovative opportunities emerging. I am extremely curious to see where fashion blogging will bring us in 2013 – what types of new media, social platforms and tools will emerge and how will we be using them. 1. Spellcheck more vigorously. Because let’s be honest there is nothing that says ‘unprofessional’ quite like bad grammar and spelling mistakes. 2. Write more copy. Pictures can indeed tell a thousand words but I would love for my readers to hear my voice more often. I love to write - I just need to set some more time aside. 3. Get out more and meet more people. At the end of the day blogging isn’t just about sitting behind a computer all day. It is about the people you meet, the places you visit, the events you go to and the connections and friends you make along the way. 4. “Be a fruit loop in a world full of cheerios”. Dare to do something completely different once in a while, even when I am tempted to do what all the other fashion bloggers are doing, wearing or writing about. 5. Make time for fashion week. Fashion weeks fascinate me and scare me at the same time. Simply because they are just not my scene – and also because I have full-time jobs that make it nearly impossible for me to travel to any of the four fashion destination. However, now that I am in London, I really need to give them a try and see what all the fuss is about. That is, if I can get though the ‘front door’ of course. 6. Publish my first eBook. Finally, the cat is out of the bag. My first ever eBook is the big project I have been working on for the past six months and I really can’t wait to publish it and get your feedback on it. Hopefully you will like it and it will inspire a new generation of fashion bloggers. I was kindly invited by the Fendi team over at LVMH to discover Fendi's latest perfum - Fan di Fendi. I generally tend to go the fresh and fruity way when it comes to perfume. However, I have to say that for a winter scent, the Fan di Fendi is just perfect. Now personally, I don't know a lot about perfume, but I can share with you what I learnt about this one. The leather note is not too strong - actually quite smooth - and well blended in with those subtle fruity notes. Just like Fendi, it is classic without being old. What perfume are you wearing for winter? The magazine under the Perfumes is the first edition of L'Officiel New talents, written and created by bloggers for 'bloggers'.